I never thought I would bring a toy to the streets and photograph it but it was fun. Strangers stopped to chat and surprise, surprise, some of them even offered me their belongings as props! The outcome of my Toy Travel shoot was going to be unpredictable. I planned to just wing it with whatever I come across on the streets. 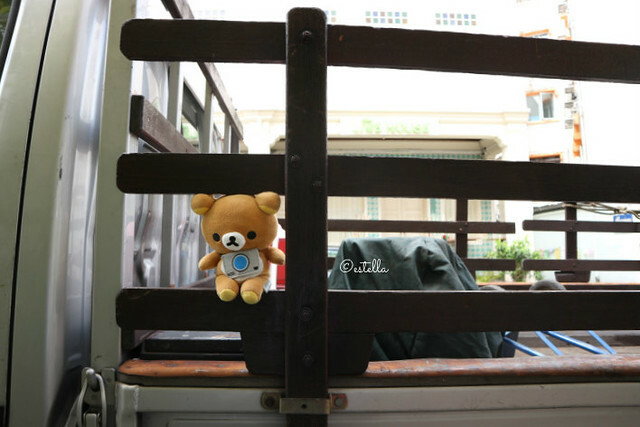 Just me, a Canon EOS M10, a Rilakkuma plus toy and my sling bag for necessities. I had less than 2 hours with the camera and could not figure out how to adjust the brightness of my shots (not a canon user!) even when I switched to manual shooting mode. In the end I gave up and just tried to compensate in other ways, like looking for a more well lit place to shoot. It’s a pity because the photos could have turned out better. I take photographs to present ideas in my mind but I am very far from being a professional photographer. However, I did discover some ideas during my first Toy Travel experience and here they are to share. When we reached the Keong Saik area the biggest headache was to get a parking lot. We count ourselves lucky already to have managed to get one by the roadside but the car would be in the sun. I put Rilakkuma on a plant that was by the parking signboard and this is my photo memory of the first world problem we had. I wanted to make Rilakkuma seem like he was walking down the alley, because said alley has laundry out for drying, the receptacle on wheels for incense paper, a mop on the exposed pipes and one way signboards. So totally authentic. This plush toy was not to made to stand, so I dug into my sling bag to see what I could use. Found my xiaomi battery pack, so xiaomi battery pack it is. Don’t forget your battery pack. You can always edit it out later, there is no shame in editing to make a picture more perfect. Toy Travel is not Toy Travel if you don’t show your travel destination isn’t it. 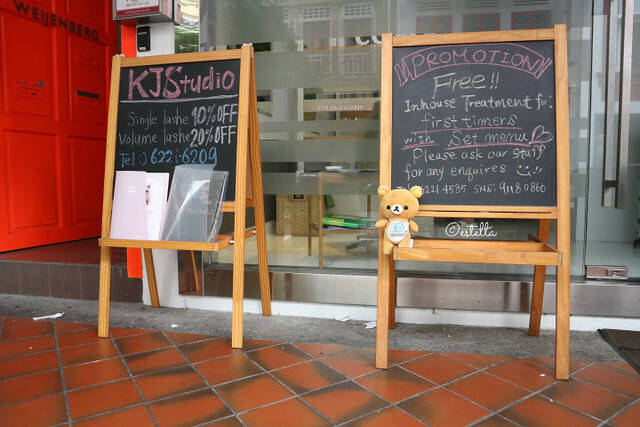 Spot the signboard above Rilakkuma’s head which reads “小红点” (Translation: “Little Red Dot”). What an interesting way to show that we are in Singapore! I sat on a kerb beside a wide drain to try and make it seem like Rilakkuma was walking towards me with the signboard on his head. Sadly, I couldn’t operate the camera to take a clearly focused picture of the signboard and my hand was not long enough to capture Rilakkuma’s walking legs. You might have better skills and longer limbs. On travels I always plan to visit some old and some new places to try and get a balanced experience of the country. An opportunity occurred when I chanced upon this spot. Perfect for capturing the old and new in one frame. 5. Where do people eat? One must do on travels is to try out the local food. This is probably where locals have their meals, right? 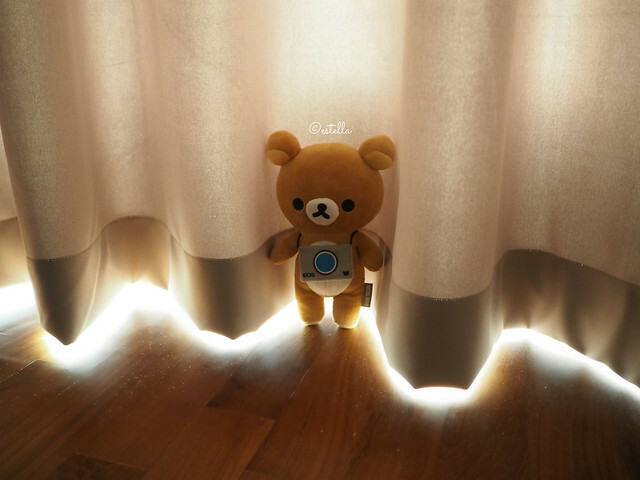 I used Rilakkuma’s body to block out people passing through. What is travelling without trying? I asked the driver for permission to drive Rilakkuma around in this lorry. Some people are super kind. 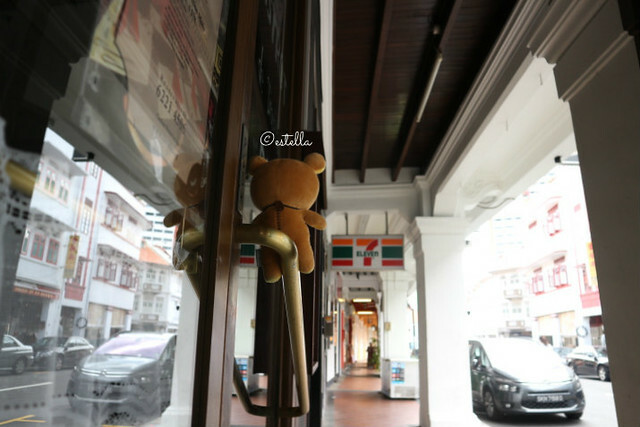 I wish the pillar wasn’t there, so that I can capture Rilakkuma sliding down the door handle with full view of his surroundings. If I were younger than 30 and had no kids, I would work and travel. Rilakkuma answers enquiries to earn some moolah for his dinner. This book was found on the bar table of a pub I walked pass. How unexpected. The sweets in the picture below were a more normal find. On hindsight, I should have tried to stack up the sweets on Rilakkuma’s head.. I didn’t have enough time to master the fish eye function of the Canon EOS M10 but I love to use it to capture images that look like I’m watching from a surveillance camera. Something different for a change. *Photograph not taken with the Canon EOS M10. Photographs can capture temperatures. Was it scorching hot when you were there? or was it super cold? Remember the feeling you always get when you reach home after travelling. A little unfamiliar after being away for some time but this is where you can put luggages and dirty laundry aside and get a good rest first. I think that’s part of the traveling experience. I’m partnering Canon to give away a Rilakkuma EOS M10 Kit III. It consists of the Canon EOS M10 Camera, two lenses (EF-M15-45mm and EF-M55-200mm) and a 24cm Rilakkuma plush toy. To join, follow the steps below or enter via widget below, after you have completed the steps. Special Note: For Step 1, you can choose to do any one of the options. It takes a lot more effort to post your own toy travel photographs on Facebook or Instagram, so I’m going to give those who do that a higher chance to win. 3. I reserve the right to determine qualifying entries and amend terms and conditions without prior notice. 4. 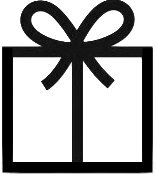 This giveaway is in no way sponsored, endorsed or administered by, or associated with, Facebook. Here are the links to my Facebook Page and my instagram account. Remember to make sure your accounts are not private, so that I can view and check them. 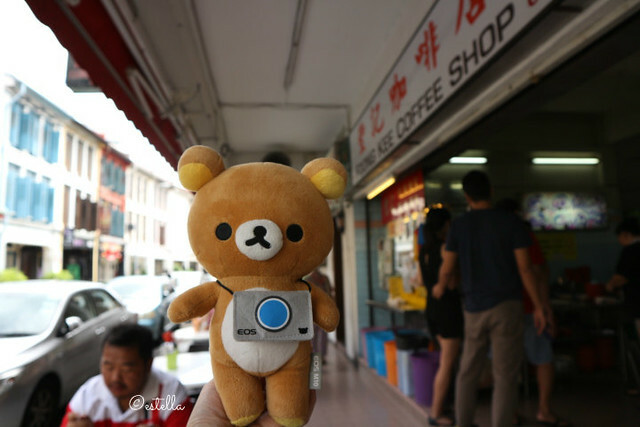 Disclosure: I was invited to shoot Rilakkuma with the Canon EOS M10. Prize for this giveaway is sponsored by Canon Singapore. I like the one on temperature change one very much! Smthg cool about the light illuminating frm below! Great shots btw! That one is my most favourite photo! The struggles you are experiencing today could very well be the strength you need tomorrow! Good luck and you get some much needed rest soon! I like the capturing of temperature change idea! It really sets the tone for the picture and gives off a certain vibe! I once went for a photography workshop by Canon and learnt that photography is the art of capturing light! That’s where I got the inspiration from! 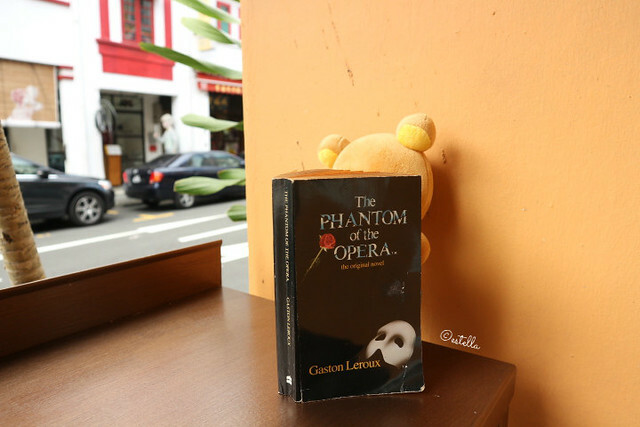 I liked the picture where Rilakkuma is reading The Phantom of the Opera (biased one coz i love anything TPOTP!!). The shot gave it a 1:1 perspective as though Rilakkuma is human size. Love the close up shots from this camera! Haha I’ve never caught The Phantom of the Opera before but I know the songs!! Close up shots from this camera is a-ok! I love the one where Rikakkuma was riding on the lorry. I love how compact this camera is ..certainly great close up shots and easy to bring about. Lorry uncle was super amused but helpful for that shot haha! The Old and New is my favourite. The contrast of the past and present is a good theme to use and captures how Singapore is today. 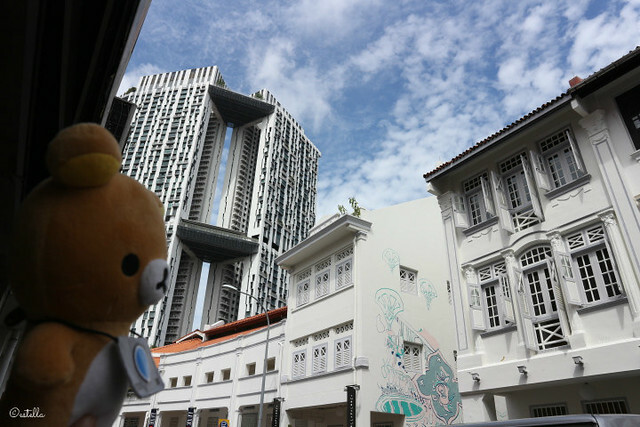 Love how Rilakkuma stands in between the old and new buildings to highlight the contrast of old and new. I was lucky to chance upon that spot! Thanks for making it interesting capturing a lot of different ideas as well as reminding a few which we know but sometime missed it like carrying an extra battery to save from running & looking for a new set desperately. The most creative idea captured my attention is Capture the location & look for the reflections. Cool way to capture & add to our memory lane to relive it later. We can look for reflections anywhere & it will definitely add an extra punk to the picture.. Thanks a lot for amazing giveaway. Keeping my fingers cross..
Glad you like the ideas! I went on Pinterest to source for more inspiration after writing this post and gosh there are so many! I love no.6 ” Try A New things”. Be a different from each other and dare to challenge yourself for a new things. 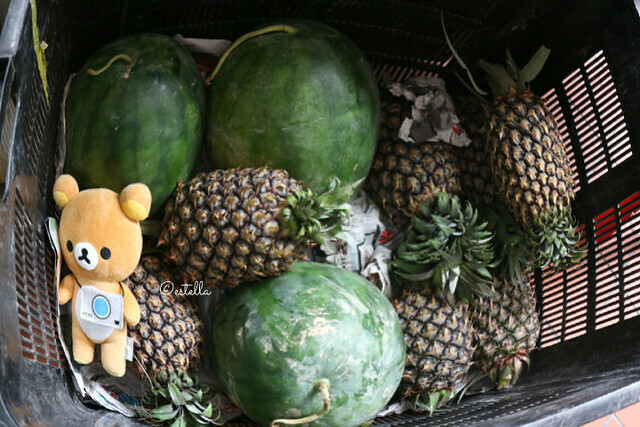 Rilakkuma will never get bored when travelling as it get to try new things. What about stunt action like travel on the hot balloon ? Rilakkuma Journey will be fun and memorable. My favourite is Travelling is also about coming home. Home is where I belong. It is a cozy and comfort shelter for me. Thats my favourite thing to do too, specially now that we have our own! Thanks for joining, good luck! My favourite is Rilakkuma coming back home, lying with those plushy slip in. So heartwarming and touched. 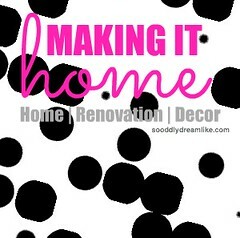 Coming back to cosy home is the best looking forward thing that I would look forward to. Home is the shelter that gives me security and a place whereby I call my own. Able to be at home with love ones is simply so loving. 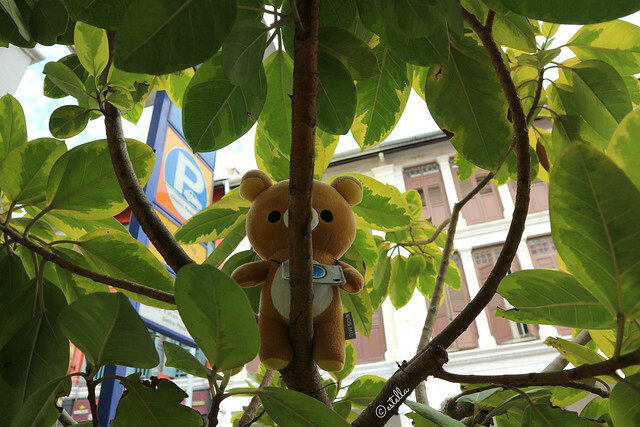 Would love to have Rilakkuma embark on another adventurous and fulfilled trip with us. Lots of memorable and wonderful memories being captured with Canon EOS M10 Camera. The plush home slippers were a happy Taobao find! I love photo #2 don’t forget your battery pack! Always good to make use of whatever we have and edit our photos to make it look good (simple edit like removing aids that help to hold up stuff, not edit until one arm disappear. Hehe!) Great idea for when we want to travel as light as possible but need our necessary photography equipment! Haha the battery pack was really useful! I’m sure you know too! 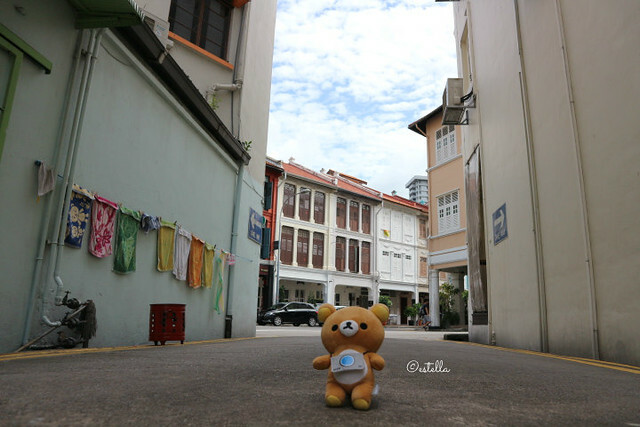 Love pix no 4, rilakkuma venturing out on its own checking out the street alleys for hidden gems for photo taking ! Once I saw the laundry being hung out, I knew I had to take a photo there! That alley was super photogenic! I liked the picture where Rilakkuma is reading The Phantom of the Opera. It looks studious! 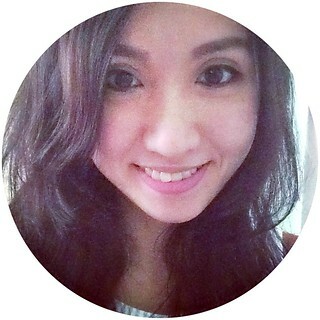 Coincidentally, it’s taken at The Study, a British-inspired Snack Bar along Keong Saik Road! 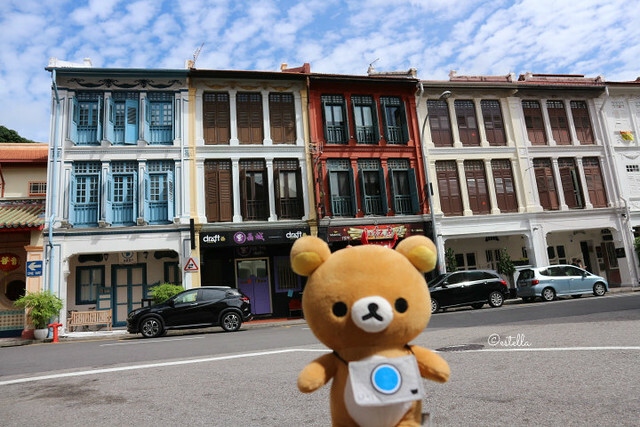 I love the shot with Rilakkuma standing alone in the alley. She looked so tiny and adorable.. and the battery pack is fabulous idea! i like looking at things in another way! It gives a reflection and new ideas and will be more everlasting in my memory! The Old and New is my favourite. I love how it captures modern and old Singapore in one photo. Great contrast! I think that taking note of reflections is a very helpful tip! It would really break the illusion if you can see the photographer in a mirror or even a puddle of water. Oh and I love its in-built wifi function which allows instant upload to social media plus its 18mega-pixels resolution! The built in Wifi Function is super useful I agree! Oh, thanks for these photo ideas too. We love travelling and I am just too lazy to make my shots more interesting. My camera is most of the time in auto mode. And when I come home to upload the photos in my laptop, there are those sighs of regret. Uuurrgghh… Photos are memories so I think I should do better next time. Haha it’s gratifying to take nice shots. No need to upload to computer, the EOS M10 has a wifi function to allow you to directly transfer to mobile! Fish eye function- wider different angles different way to take tons of photos for my boy. The fish eye function was a surprise find! Capture the temperature caught my attention, someone new for me to think about when taking photos! Haha I was inspired by the super hot weather recently. LOL will she share her toys with you? My favourite toy travel photo is “The old and the new”. I’m nostalgic at heart and I love how you managed to capture both past and present within the same spot with Rilakkuma ‘pondering’ at the side. Thanks for hosting this super awesome giveaway. Haven’t been this excited about a giveaway in a long time! I have never try toy travel series, so I am finding this blog post interesting that I hope to try this ideas! I especially love “5. Where do people eat?” because I am a food lover so I would love to bring my toy around with me and taking photos of what I have using the toy to say a story of my photo! Well, try it! Super fun! I like “The old and the new” because the photo turn out to look so professional and it seem to to tell a story of the old and new buildings like the changes and evolution of Singapore !! Yup, it was a nice spot! my favourite is 8. Take note of the reflections..I too love to take photos on my own reflections!! Simply love your Toy Travel series especially the The old and the new . The contrast is interesting. Thanks for sharing such good tips! Haha I hesitated to call them tips, so I called them ideas! i like the one of Rilakkuma reading the book. the tip to use whatever you can find is practical! Haha I love the excitement of finding something interesting to work with. Like the book, I was doing fist pumps in my mind when I saw it. My favourite photo is that of Rilakkuma thinking if he is going to follow the sweets! It is very cute but I find a different side. I felt connected to the photo. Plus, I love sweets!? Travelling is also about coming home…indeed. I love the shot of Rilakkuma on those fluffy bedroom slippers..how comfy he is!. After discovering new places, meeting new people, learning a culture, tasting the local delicacies…you’ll always have this one special place…Our Home. It’s the place I never get tired to ‘explore’ and get my nights good sleep. 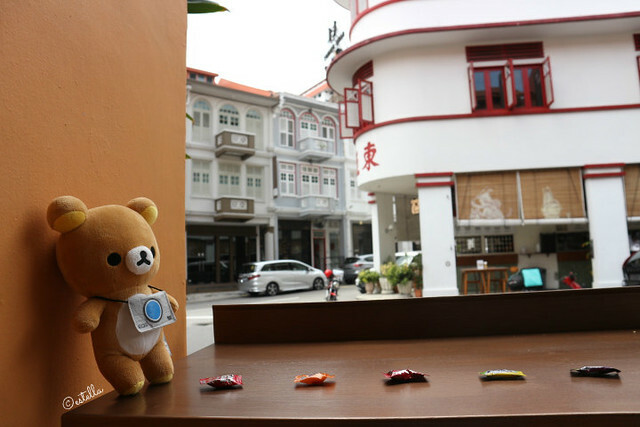 Totally loving Rilakkuma in the old and new setting of Keong Siak Road. My favorite is Rilakkuma lying down on the beautiful floor tiles. It feels so relax and cooling especially in our stressful lifestyle and hot weather. The picture is so well taken that I myself feel like lying down on it too. Since I go there every weekend maybe I will try to do that too. My favourite is Number 10 – Use what you can find just like in real life you always make do with what is available and create less stress upon yourself! I love how the photograph capture when temperature change! Cool and interesting! My favorite is the Rilakkuma in a charming old school window grills. I love the idea that people can stand in the kitchen of the cafe/restaurant to look left and right out to the scenery and people passing by. Yep, the cafe is at a very good spot. Super feels. I love the 5. Where do people eat? toy travel idea. I love Rilakkuman sitting at the Snack Bar along Keong Saik Road as whats better than to relax in a nice cafe & read a nice book on a hot sunny day. My favourite Toy Travel is” Traveling is also about coming home”. Personally love traveling also but I will miss home whenever I’m out of town; Miss my country, my family, my nest, our local food and many many more. No matter where we travel, home will always be best. I like picture 12 as I actually hadn’t thought of using that concept to capture the temperature significance! Great idea and one that I can learn!